Anil Kumble: Surprise selection as Team India Coach | Make Time For Sports. 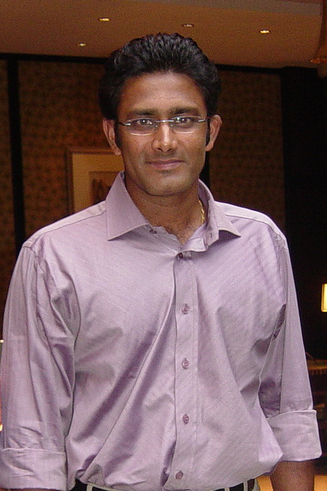 Anil Kumble is the newly appointed Team India coach. That must be the most important job in the country after the Prime Minister’s, right? There you go, that is the actual reality of an Indian coach and his position within the team. Hence the media excitement, every time, around the appointment of an Indian coach, baffles me. This is not to deride or belittle Anil Kumble’s credentials in any way. Kumble recognises the above reality and claims that he’ll be more of an ‘elder brother’ to the side. “In Indian cricket, the captain and a couple of senior players basically chart the destiny of the Indian team. The selectors have an important role to play in this journey. If the captain is able, there is nothing wrong with this kind of culture; many great teams have been built like this. So what an Indian coach really does is facilitate the needs of the captain and the core group and try and keep them in good spirits. Kumble made a three-year-plan presentation to the Cricket Advisory Committee but has been appointed for only a year. Ravi Shastri’s stint as Team Director and the results under his tutelage paved the way for the selection of an Indian coach. Can Kumble prove as adept as John Wright or Gary Kirsten in handling this young side? India play 13 Tests at home and his tenure includes the Champions Trophy. ‘Jumbo’ does not have a long rope and there is speculation that he was not an unanimous choice. Kumble has no formal coaching experience but then neither had Shastri. That appears to have made the difference since he was not in the initial shortlist. The CAC selected Kumble—possibly—because he is a much younger candidate and can keep pace with the youngsters in the side. John Wright and Gary Kirsten were not too long retired when they took over the reins of the Indian side. A younger person can be more hands-on; Kumble certainly believes he can be. Is hands-on what the job requires? Depends on how you define it. Kirsten felt that it played an important role while he was coach. He used to spend hours bouncing balls at the senior players. His ability to handle fragile super-egos cannot be underestimated. Kirsten’s right if we are go by what Manjrekar writes. And he is an expert. Players like Virender Sehwag and Virat Kohli prefer to consult their old coaches on technical aspects of their skills. Is it less likely that it’s not the same for the current batch of players? Ajinkya Rahane and Robin Uthappa have retained Pravin Amre as their go-to person for improving their willow skills. It does appear that what a coach brings to the side is intangible but the results are visible and rewarded or penalised with much more alacrity. Simply put, the coach is the fall guy should anything go wrong.